The telecom tower industry is growing extensively with the ever increasing customer base to cater to operators across the world. Tower operators need to ensure 99.9% uptime for their sites and maintaining this figure is becoming a challenging task. To attain this uptime, 24 X 7 monitoring of tower sites is required. The need of real-time tracking of passive infrastructure, including people, assets and energy, has created a demand for a comprehensive tower management tool which can help to synchronize this data monitoring as well as generate meaningful actionable events to improve and keep up the agreed service levels. TowerXchange: What are the key issues faced by tower companies during operation management? Ankur Lal, CEO, Infozech: Tower operators face several issues during operation management. These issues begin right from site acquisition and continue through the lifecycle of tower operations. At the time of site acquisition, tower operators do maintain financial asset register but what they lack is operational data registers such as AMC renewal, vendor associated with AMC, warranty of assets etc. CFOs are finding it difficult to map the actual operational cost with financial cost. There is a lack of automated process to validate specifications of the assets deployed at various remote sites. It is becoming more and more difficult for tower companies to timely perform preventive and corrective maintenance at tower site to ensure 99.9% uptime. In the present scenario, maintenance activities are tracked through, inefficient manual process. There is urgent need of a solution that helps maintenance team to manage their tasks and also offers real time tracking of all preventive and corrective activity at the sites. This would enable tower operators to get reduce their revenue losses and penalties. Biggest issue faced by tower operators is that tower sites are prone to theft. Most of the time thefts are reported as a legal issue but no knowledge base is maintained for such thefts for future reference. In order to derive pattern and meaningful intelligence to avoid theft, one needs to analyze theft related data. Once the tower companies have identified and analyzed the assets that are susceptible to theft in each region, they can easily take proactive actions to protect the assets from being stolen. Infozech precisely addresses these issues by implementing “Discipline of Action” with its iTower product suite. TowerXchange: How does consolidated RMS data from various vendor ecosystem helps in effective decision making? Ankur Lal, CEO, Infozech: Monitoring of tower sites is a tedious task. Operators have several sites with thousands of alarm being triggered every month. Decision makers are often overwhelmed with the huge amount of monitoring data. It’s easy enough to get distracted when you’re working with too much data. RMS data collected from site contains noise. In order to efficiently utilize this data, it becomes vital to filter out the noise. This in turn enables tower operators to perform intelligent actions and take better management decisions. Noise can be eradicated by 80:20 rule. Once the unwanted data has been filtered out it becomes easier to analyze desired outcome, business challenges, best case scenario, and worst case scenario. It also enables tower operators to perform comparative analysis of various vendors. Infozech’s iTower represents effective data into organized reports, monitoring screens and dashboards which enable tower operators to identify pain points and plan operational activities efficiently. TowerXchange: What does the iTower suite consist of and how will it help customers to implement “Discipline of Action”? Ankur Lal, CEO, Infozech: iTower has nine core modules through which “Discipline of Action” can be implemented. iROC (Infozech’s Remote Operating Centre): iTower has a comprehensive module to remotely monitor the tower operations, called iROC. It provides an end-to-end solution, from data fetching, tracking, monitoring to controlling and reporting. With the help of iROC, tower operators can manage day-today activities from a remote location and control the critical events through real-time dashboards and reporting tools. iROC can integrate, aggregate and correlate alarm from different power or RMS vendors on a single platform. Thus, user can save a lot of time and resources to track and monitor the site and improve their uptime. All site alarms are tracked from generation to closure using this module. For some of our customers, iROC is the main operational dashboard for 24X7 monitoring of the sites for SLAs of uptime and help them to take actions on a real time basis. iETS (Infozech’s Energy Tracking Service): The majority — about 30-40% of total operational cost— for running a tower’s operations is its energy costs. iETS helps passive infrastructure providers to get access to real time information about electricity usage and the movement of fuel. iETS offering is closely supported by experts that train and encourage the field staff to adhere to the company’s processes of fuel supply uptake and usage. Tower companies can further enhance their portfolio of carbon footprints with the help of iETS. Through this module, energy sources can be tracked effectively, thus extra money spend on managing energy resources can be saved. One of our customers uses iETS to track daily variances in budgets (or P&F costs). iETS provides them an Executive Dashboard, which the senior management team reviews with regional heads on a weekly basis to track past progress, and create plan for upcoming week – both the past deviances and the future plan can be seamlessly recorded and accessed in iETS. Over time, this culture of DATA based Accountability helped our customer to win a prestigious recognition from a 3rd party audit firm. iMaintain (Infozech’s Maintenance Management): iTower always keeps a check on maintenance activities happening on the site through this module. iMaintain helps operators to address the asset maintenance issues effectively and efficiently by scheduling different maintenance (Preventive/Corrective/Predictive) activities and resolving critical events through the incidence and theft management feature. User can manage the site and can opt for preventive maintenance rather going for corrective maintenance, thus reducing operational cost. Tracking the maintenance leads to a higher ROI on the assets on site. One of our customers use this to enable operations team to do corrective maintenance on time thereby increasing the uptime for the site. By maintaining the matrix for roles and responsibilities for maintenance, the efficiency of the operations is tracked and improved month by month. iBill (Infozech’s Billing Module): To run a tower optimally, there are a high number of consumable items such as electricity, diesel and other energy sources. iTower has a module called iBill to ensure that all the consumption related data can be integrated for reliable billing. iBill helps tower operators to automate their billing process by integrating all vendors/ telecom operators thereby reducing billing conflicts. Tower operators can easily access the power and fuel consumption data from a centralized location along with the recovery of energy usage. Using iBill, tracking of fuel and energy consumption is easy and transparent, so that user gets billed only for exact amount of consumption. User can manage billing for various operators in a single go. One of our customers uses iBill to generate bills for all their tenants on time thus meeting the SLA to ensure service continuity, quality and timely output. Various types of agreements between towercos and operators are catered to e.g. fixed cost, pass through, retrospective and supplementary billing etc. Another customer generates bills based on data from varied sources (e.g. RMS, average data, and fuel bills) to then compare and analyze these before deciding which one should be sent to the operator. A workflow which allows customer to view and approve site level data of the bills ensures reduction in payment delays due to billing disputes. iAnalytics Energy (Infozech’s Energy Analytics module): Passive infrastructure providers can now address their specific questions and improve their operational performance by taking the right decisions enabled by online analytical processing. The data captured across various automated modes can be easily correlated and aggregated into the Infozech’s Analytics platform where it can be further processed for real-time action and delivery. Future analysis for various sites infrastructure and operations can be done using this module, and in doing so, the user can save both time and resources by planning events in advance. iAnalytics Battery(Infozech’s Battery Analytics Module): This module helps in improving performance and life of a battery through continuous tracking, monitoring and control. It includes reporting and analyzing various battery parameters which are crucial for the functioning of a battery. Based on the operating conditions, the remaining life of the battery can be predicted and recommendations can be made on controllable parameters like depth of discharge so that overall life of battery is increased. 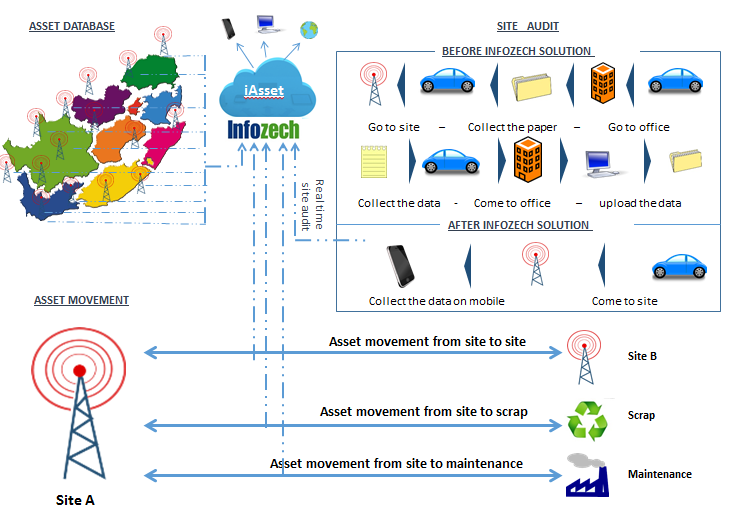 iAsset (Infozech’s Asset Management): iAsset enables tower companies to understand the location and type of asset present at the site. With the integration of site assets into a master database, iAsset allows users to keep a check and audit the site. Asset movement activity can also be captured to keep a real-time tracking of assets. Health reports are generated to monitor the utilization of remote assets. iAccess (Infozech’s Access Management): Infozech’s belief in providing secure solutions for this industry has resulted in the development of the iAccess module. iAccess provides a platform for tower operators to securely access their sites and monitor the site accessibility as well as the performance of guards and field personnel. This module works seamlessly when integrated with access control devices for time/duration based access codes. This contributes to enhancing the life of different equipment located at the tower sites. TowerXchange: Finally, please sum up the role of Infozech in improving the profitability of the international tower industry. Ankur Lal, CEO, Infozech: Infozech has played a major role in developing products and applications that are helping Indian and International tower industry to build a culture of DATA based Accountability, leading to DISCIPLINE of ACTION. The tower industry faces huge challenges such as inefficient tracking of assets and resources, unavailability of relevant and integrated data, accuracy of the bills generated and the lag time between getting the billing data and generating the final bill. Moreover inability to make sense of collected data to take the right business decisions. iTower addresses all these challenges with its suite of products thus helping tower operators find the right ways to improve their bottom line.